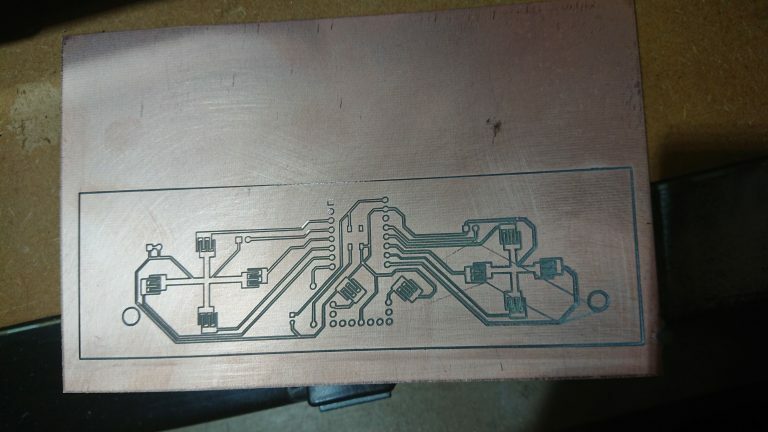 In this adventure I attempt to get the Roland Camm-2 2300/A CNC machine to mill a PCB into some copper board. This is what the temporary setup looks like. 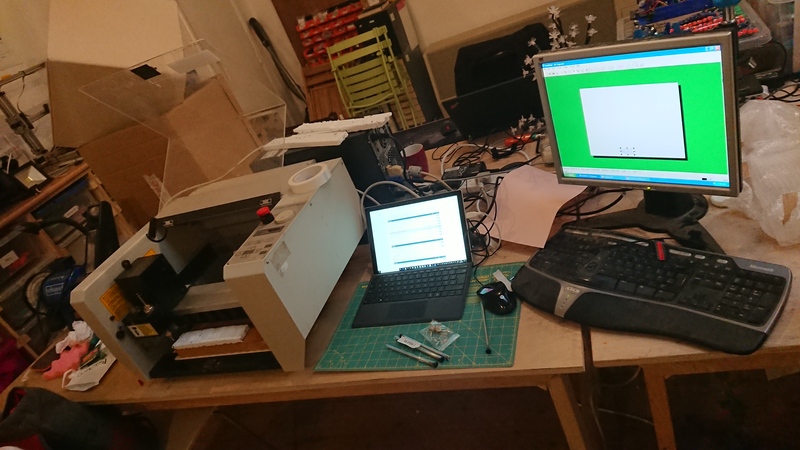 I have the CNC machine, laptop, and an old XP machine. We have procured a set of tools for the Roland specifically for milling and drilling PCBs. I started by testing on some polystyrene (as in the above), which seemed to go OK so I thought I would move to my PCB project. I took the Copper layer and converted it to a bitmap such that Dr Engrave can import it. It was at this point I knew I was in too deep and it could only go wrong. I stuck down the copper board with some double sided tape. After some fiddling with the tool settings and trying to position the tool itself correctly on the Z-axis, I pressed the “print” button and closed my eyes! There was not too much I could do at this point, it was either going to start neatly cutting out the tracks or crash into the end and start eating itself. My polystyrene test did not fill me with any more confidence, but my hand was positioned over the emergency stop button. It’s not what I expected, but for my first attempt I suppose it could have been worse. Let me take you through it. Thats all for today, I will keep you updated on the progress. OK so I’m really going off on a tangent now… I have decided to work out how the controller of my heating system works, and to a smart modification. This is likely pt1 of 2. 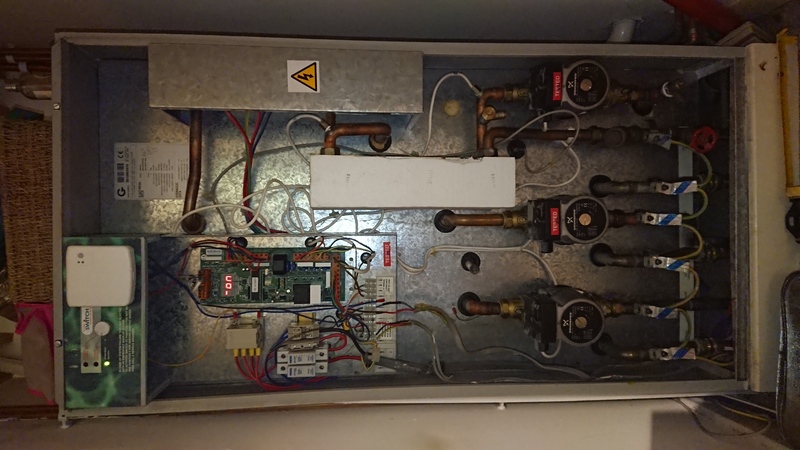 Here is the system, the wonderful Boilermate 2000. In the top left is the PCB that runs the various pumps and things. These have a habit of failing every year or so, so I have built up a small collection of partially failed boards. I decided to attempt to work out how they worked and see what hacks I could do to them. 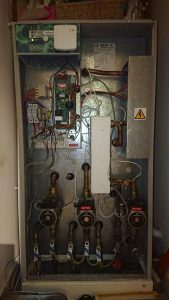 This board is responsible for taking an input switched live signal from an external thermostat, monitoring the hot water tank temperature, controlling the Boiler, Boiler Pump, DHW pump and Central Heating pump. This is a GT155 with the updated LED display driver. This one suffered from not being able to turn the DHW pump fully on, I think a triac has failed, but I don’t really know how to test it and to watch me desolder anything is like watching a lion pull the carcass of an antelope out of the passenger door of a nissan micra whilst balanced on a cliff top – like at the end of the Italian job. It’s dangerous, messy and probably doesn’t end well for anyone. Let’s talk through what we have here. Let’s take an in-depth look at some of these components. 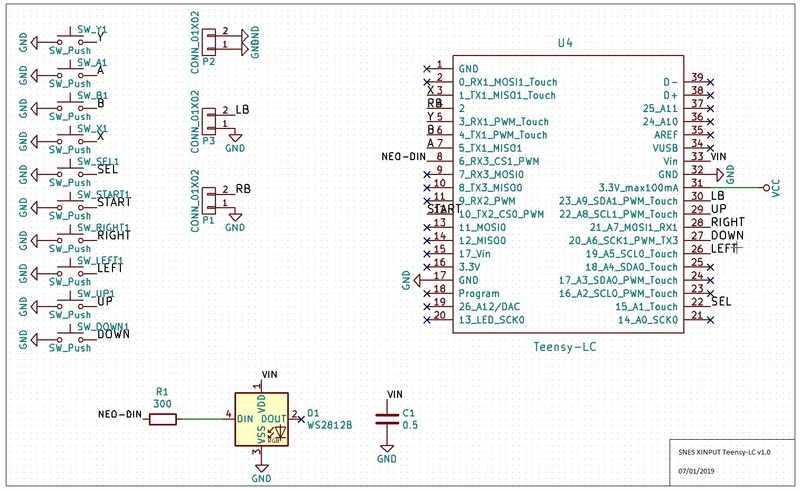 The main CPU is a AT89C55 8-bit microcontroller with 20K of flash with 32 I/O lines. It is in PDIP configuration and socketed for easy extraction (he says instantly bending 4 of the pins). I misunderstood what this was a first, I thought it was just an EEPROM and tried to interface with it using SPI to read its contents. After a couple of hours failing at that, I actually looked at the datasheet and followed the traces again to discover that in fact it is a CPU supervisor (with some EEPROM) and that it was just being used to keep the CPU reset if the Vcc was below Vtrig, some kind of low voltage protection mechanism. Boilermate 2000 the jumpers are on positions J1, J3 & J4. 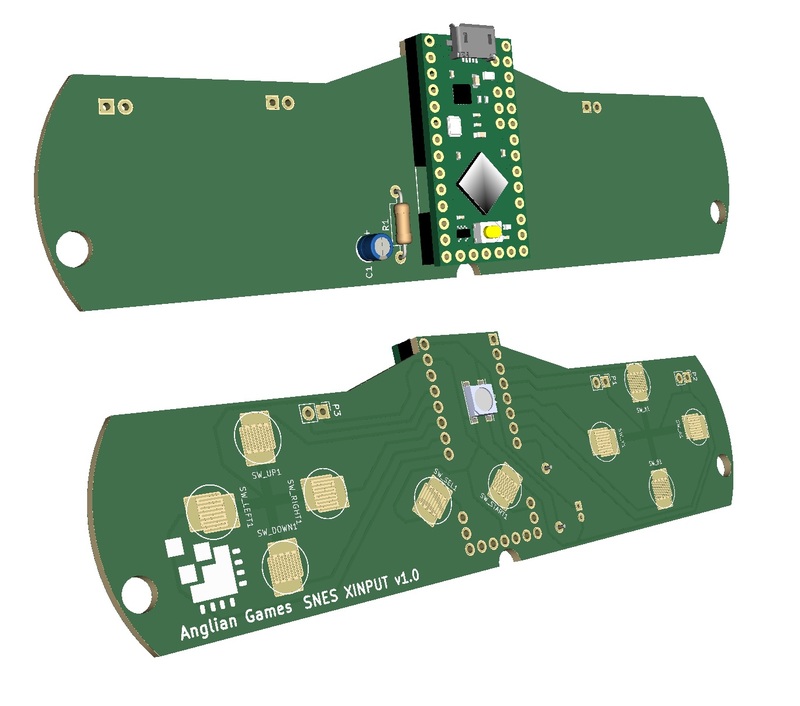 This PCB will fit the units above and can be used in place of GD131 – This model also fits other products but will need the jumpers re-configuring to suit the application. 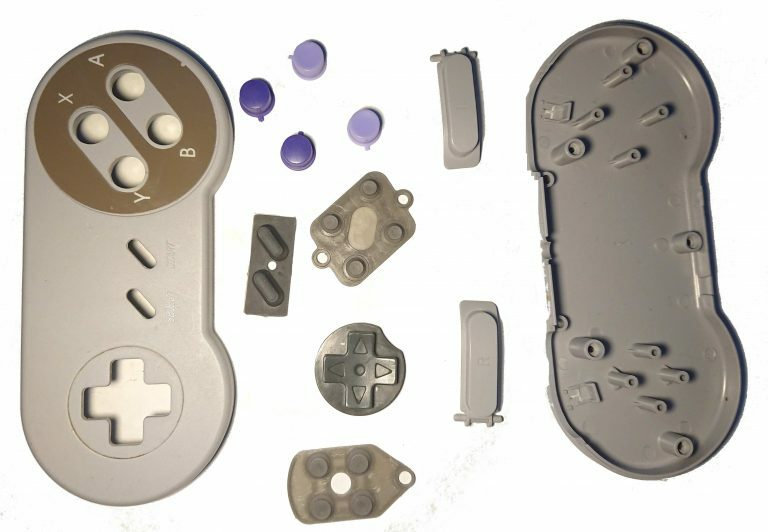 Instead of trying to finish off one project at a time, I got distracted with dissecting a SNES controller. In this brief project I am converting it into an XINPUT compatible controller by way of a custom PCB and Teensy LC. Firstly I cracked open the case a got a good look at its innards. Its made up of the PCB, buttons and rubber parts with conductive pads. The challenge is to fit a Teensy-LC into the case, in roughly the same size PCB. As with my other XINPUT Teensy project, each button needs wiring to GND and a GPIO. I decided to upgrade the controller a bit by adding a Neopixel. The layout took a few iterations and much measuring before finalising it. 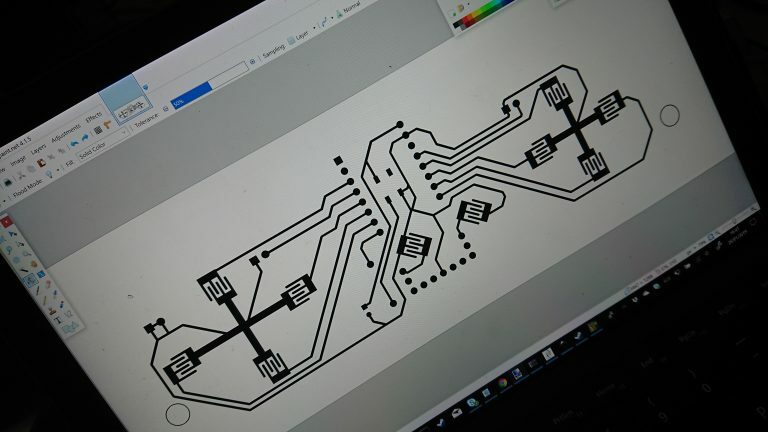 My first challenge was to create a footprint for the button contacts. 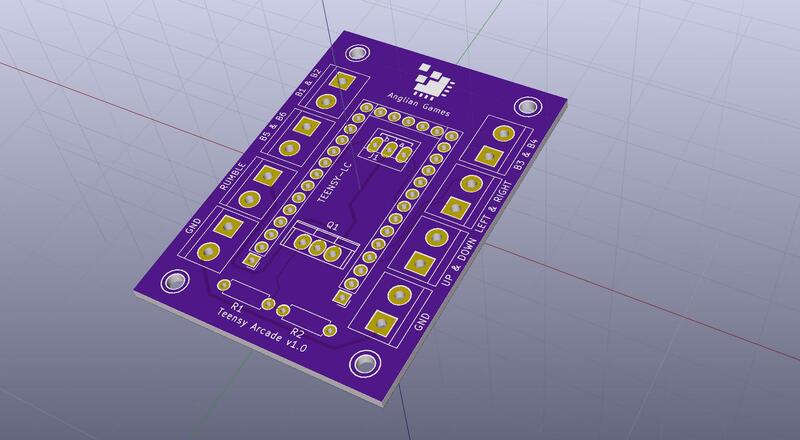 In order to make pads of custom shape, I needed to upgrade to Kicad 5. To make the custom shape, one had to create a pad, then draw the rest of the irregular shapes using “graphic lines”. Once done, select them all, RMB and use “Create Pad from selected shapes”. The gaps between pads are 0.5mm. 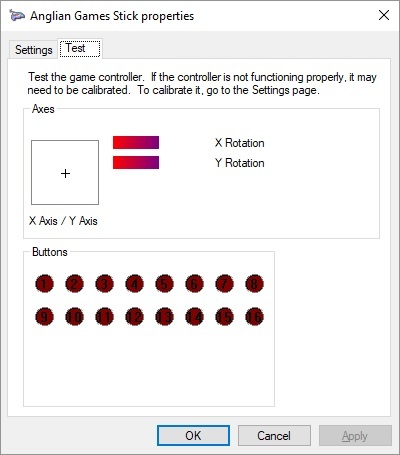 The code is this time based on MSF Flightstick, which is a very easy way to make an XINPUT compatible device. I should really have done something cool like put an accelerometer in it. I think the next one might be wireless. I have found some sweet looking 433MHz modules “HC-12”, which I will mess around with in another blog. Here is it printed out and placed in the case, if only I could laser print copper.. It isn’t as badly aligned as it looks, that is just the parallax effect. It is that filthy though! As I can get away with not plating the through holes I am tempted to use the recently renovated CNC milling machine in the makerspace to make the board. OSHPark nicely gives me the various layers, top and bottom copper, soldier mask and silk screen and drills. I guess I would have to figure out how to generate those layers myself from Kicad and make sure the dodgy Roland software running on Windows XP can understand it. I will also need to research if I can add soldier mask myself and how I can mask the pads. Yet another blog I think! I will do a seperate blog on my attempts to resurrect the Roland PNC-2300A! Once I have produced a board and tested it, I will link to that blog from here 🙂 That is all, until our next adventure. Adventure #3 – If I could chuck wood…. Merry Christmas adventurers. 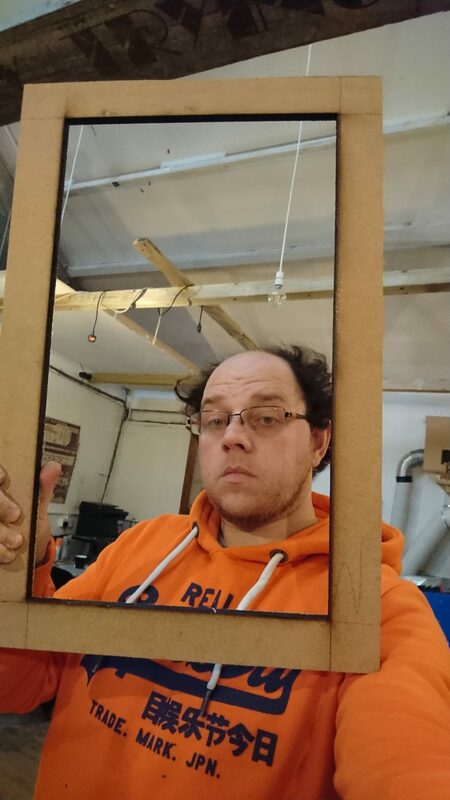 In this adventure I am building the frame for my arcade machine. It is built of Wickes’ finest 12mm MDF. It is held together with pine and prayer. My brother and I used the tablesaw to cut the front, sides and back. In this image it is waiting for its face. 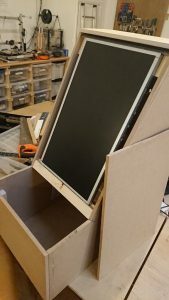 I have stripped down an LCD monitor and mounted it in the frame. After getting the frame together and standing in front of it, it only really seemed big enough for 2 players. 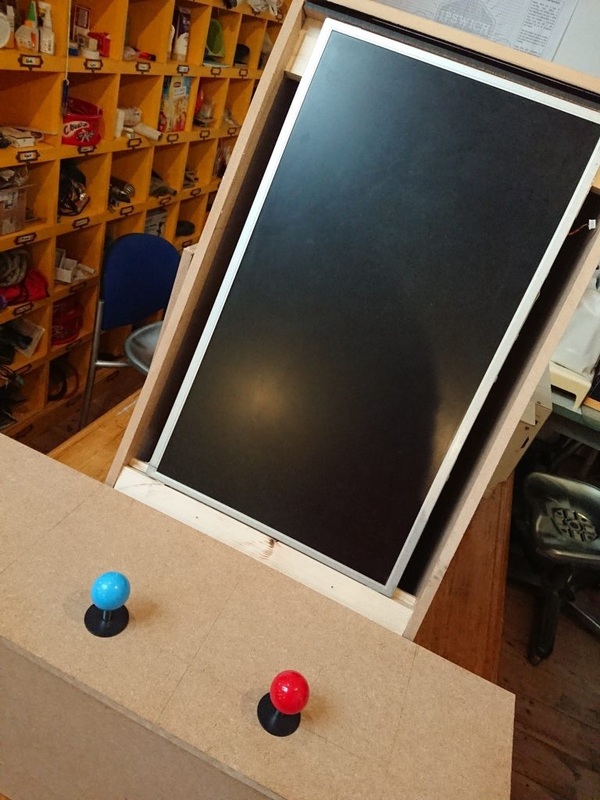 I have tested mounting the joysticks. 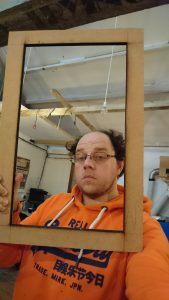 Kindly Ipswich Makerspace’s own superhero Adam helped laser out the screen surround on “Helios” the big laser. Something to do with my day job, I forget what it is now, probably Internet or phones or something. Afternoon adventurers. As part of my project to build an arcade case for Laser Defender game, this weekend with my good friend Matt G, he has been instructing me in the ways of the metal worker. To test out the analog axis of my Teensy USB ga mepad, I needed some potentiometers, which needed finishing with same handles. 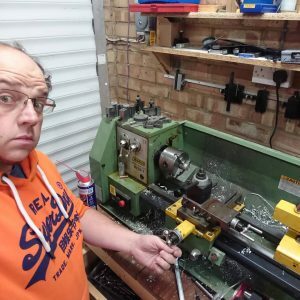 I found some old kitchen drawer handles and put them to work on Matt’s lathe. 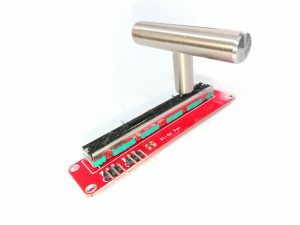 This works great as a throttle control in “Simple Planes”, next step is to build a housing for it, or maybe integrate it into a custom keyboard project. Yeah I dunno what this is really for, but its a turny handle thing. Im sure I’ll want a turny handle thing at some point. 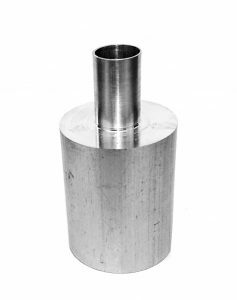 Actually all of the lathing was really for helping make some metal adapters for mounting rumble pack motors to my XINPUT arcade sticks, which look a bit like this. These are 2 separate parts “smushed” together (technical term). 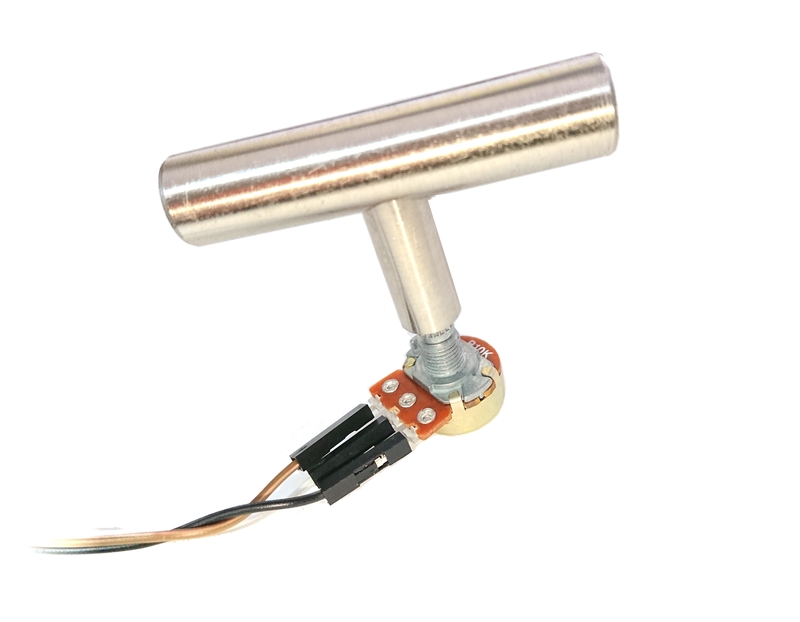 When mounted on the stick, look a bit like this (rumble motor up underneath). That’s it for now. Hoping to get my circuit boards next week! I have been experimenting with using Teensy-LC as USB gamepads as part of my Laser Defender Arcade machine. I found some articles with half examples, non functioning examples and many forums with people in the same situation as me, limited knowledge and a pile of errors. Not being a software developer by trade, it has been an interesting journey recently into Unity with C# (courtesy of Ben Tristem, for giving me access to his course) and further delving into microcontrollers, this time the Teensy-LC. I have found 2 solutions that I will document here. This actually works as documented: https://github.com/zlittell/MSF-FightStick. I copied the files into an arduino 1.8.6 directory and it compiled and uploaded. 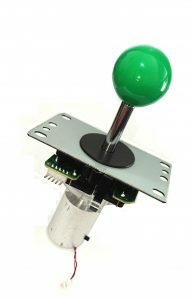 MSF Fight Stick is a very nice way to make a custom controller for XINPUT games. I am using XINPUT on Unity as I dislike the Unity Input system, as did a Canadian dude called Kenton, who instead made is own custom HID-based device also using the teensy. – I performed all the source modifications listed by Kenton on his blog but for the boards.txt it is different (see embigged). Now I have a device like this, with my own device name ! As a bonus, I made this extra function in usb_arcade.h to make the axis analog. Deadzone configuration option and full example coming soon. The next steps in USB controller development is to create my own custom HID descriptor that contains only the buttons, axes and hats I (want) need. This will come after learning much more about the lower layers of USB and setting myself up with some tools to monitor the bus. I will also get some analog devices (compass, accelerometer, potentiometer, temperature sensor, theremin?) to make some interesting input devices for my Unity games.